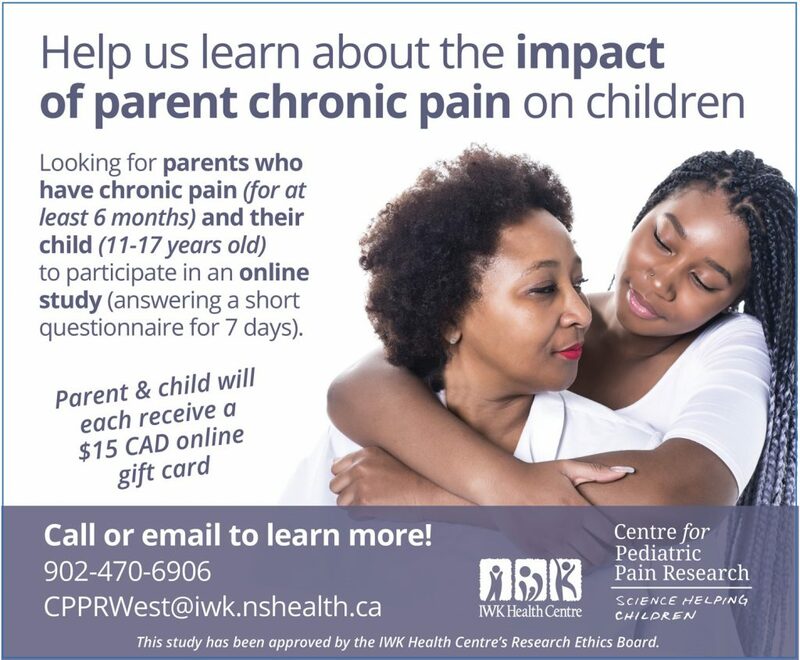 Parents with chronic pain and their children ages 11-17 years are needed for an online research study led by researchers at the IWK Health Centre. For this study, you and your child will be asked to complete a short daily diary once a day for 7 days taking only 5-10 minutes each day to answer the questions. Call us or email to learn more! We recently finished another part of this study where we interviewed parents who have experienced chronic pain on a daily or almost daily basis for at least 6 months and who had a child between the ages of 11 and 17 years old. We asked both parent and child to participate in a telephone interview during which we ask parents questions about their experiences as a parent with chronic pain and we ask children questions about how they feel and react when their parent has pain. Thank you to all the families who participated! Stay tuned for more details on this study and if you would like to learn more contact us by email or phone! Copyright © 2019 | Dr. Christine Chambers.